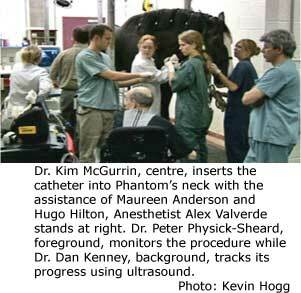 A one of a kind horse has a new lease on life thanks to a technique pioneered at the Ontario Veterinary College. The nine-year-old Clydesdale was successfully treated for atrial fibrillation (irregular heart rhythm) by using catheter-mounted intracardiac electrodes to deliver a high-voltage jolt to the heart. The patient, an 885-kilogram colossus named Phantom, is the largest ever treated using the technique, says Dr. Kim McGurrin, Clinical Studies. "With a large, heavy horse there is always an anesthetic risk, so we had to work as quickly and efficiently as possible. And then it's just uncharted territory with the cardioversion. The largest horse we've ever done prior to this was 730 kilos," McGurrin says. This arrhythmia is traditionally treated with the drug quinidine, which can have adverse side effects. Plus, some horses, especially larger breeds, don't respond well to the drug. "This horse was in atrial fib for at least six months to a year. And historically, it was thought that if a horse was fibrillating for more than four months, it had an extremely poor chance of responding." Phantom's owner, Stanley White Jr. of Argyle, Texas, searched for treatment alternatives for nearly a year. Finally, his veterinarian heard about the technique developed at OVC by a team that includes McGurrin and Drs. Peter Physick-Sheard and Dan Kenney. Within days of contacting OVC, White loaded Phantom into a trailer and drove 2,500 kilometres to Guelph. Phantom underwent the procedure on Oct. 6, and was on his way back home two days later. "I'm just ecstatic with the results. He is one of a kind. They just don't come that big in black," says White. Phantom stands more than 19 hands high (about 6-foot-6 at the shoulder); so big that White has been unable to find a perfect hitch-mate for the gentle giant. White believes the heart problem emerged after Phantom over-exerted himself during a competition more than a year ago. "It couldn't have worked out any better. I just wish we found y'all a year ago," he says. OVC was the first in the world to successfully adapt to horses a treatment that is commonly used for atrial fibrillation in humans. It involves threading two catheters from the horse's neck through the veins into the heart and positioning the electrodes in the right atrium and pulmonary artery. The catheters are fitted with electrodes that deliver a shock to correct heart rhythm. Recovery time is much quicker than with conventional methods: horses receiving the treatment can be doing light work within two days and resume regular training in a week. The innovation has the world beating a path to OVC's door. Scientists have come to Guelph from Belgium and across the United States to learn about it, while McGurrin has demonstrated the technique to veterinary colleagues in Florida and presented results to cardiologists in France. The OVC team's work was also featured at the 2005 American College of Veterinary Internal Medicine forum in Baltimore and McGurrin will be presenting at the American Association of Equine Practitioners convention in Seattle in December. "Several schools, including Cornell, Florida and Ohio State, are starting to use this procedure based on our experiences here at OVC," McGurrin says.